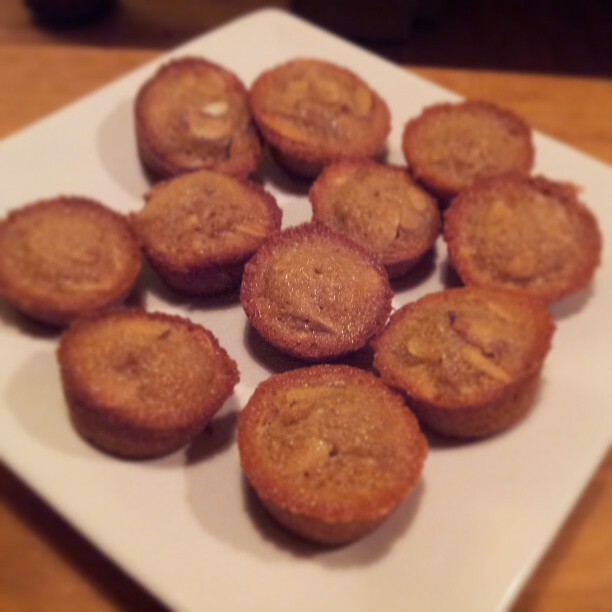 A friend of mine forwarded me a recipe for pecan pie tarts. It looked rather bland, but a good starting point. After a few tweaks and substitutions, I came up with the recipe below. The almonds provide crunch, the edges are a little crisp, and the browned butter provides a great toasty flavor. This makes 18 tarts. Grease 2 mini muffin tins. Preheat the oven to 350F. Toast the almonds in a dry skillet over medium heat until they are light brown and you can smell them. Remove from heat and place in a medium sized bowl. Melt the butter over medium heat. Continue to cook, swirling the pan occasionally, until the butter begins to brown and has a nutty aroma. Let cool slightly, then add to bowl with the almonds. Stir in the flour, brown sugar, eggs, vanilla, salt and cinnamon into the almond-butter mixture until combined. Add to muffin tins, filling each cup about 3/4 of the way full. Bake at 350F for 15-20 minutes, until golden brown and a toothpick comes out clean. Let cool 15-20 minutes, and enjoy!